Peltor Bullseye President Hearing Protectors combine the high attenuation image of Peltor 's top ear muffs with the compactness of a folding earmuff for the ultimate in protection, comfort, and convenience. 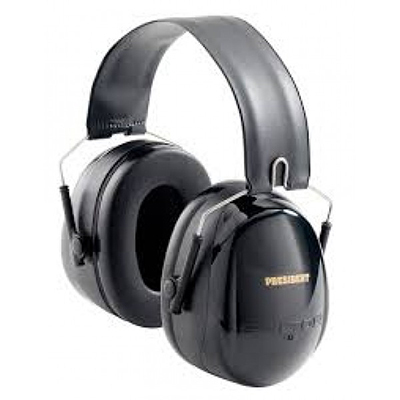 These Bulls Eye President Hearing Protectors by Peltor feature a Noise Reduction Rate (NRR) of 26 decibels (dB) for a comfortable hearing level in high noise environments. These Peltor Hearing Protectors also feature a comfortable design that have the user forget they are wearing an ear muff, and focus on the job at hand. The Peltor Bulls-Eye President Hearing Protector has liquid/gel filled cushions and an adjustable folding headband that will give the user a custom fit. For a hearing protector with high effectiveness and a comfortable design, the Peltor Bullseye President Hearing Protector 97069 will get the job done.